Really Simple Syndication (RSS) is a family of Web feed formats used to publish frequently updated workssuch as blog entries, news headlines, audio, and video in a standardized format. An RSS "feed" (also called a web feed or channel) includes full or summarized text, plus information such as publishing dates and authorship. Web feeds enable users to read or view up-to-date content from multiple sources, in a single location. No more hunting through Bookmarks for your favorite websites, the aggregator does it for you. RSS readers are software programs that collect, organize, and display RSS feeds. 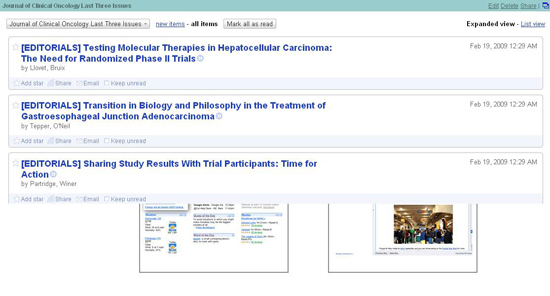 RSS readers, also called aggregators, allow users to scan headings from a multitude of blogs or news sites and stay current with Cancer.Net's articles and activities. An RSS reader, feed reader, or aggregator, which can be web-based, desktop-based, mobile device or any computerized Internet-connected device. How Often are RSS Feeds Updated? The update frequency of Cancer.Net's RSS feeds vary per feed, but are updated at least monthly. 1. Enter the feed's URL into the reader or click an RSS icon in a browser that initiates the subscription process. 2. Select the reader, from the drop-down list. 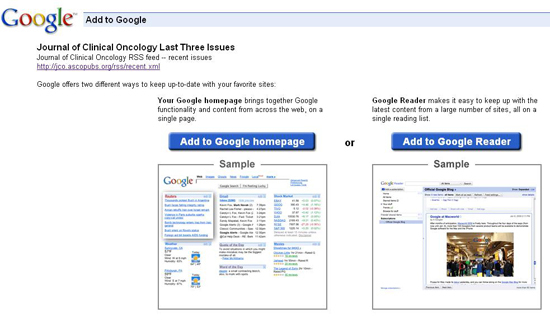 In this example, you have the choice between Google homepage and Google Reader. The RSS reader checks the user's subscribed feeds regularly for new work, downloads any updates that it finds, and provides a user interface to monitor and read the feeds. Once the list in your feed has been generated you have several options, Edit, Delete, and Share. Edit enables you to select the number of articles that will appear in the reader. Delete is for removing articles from the feed. Share enables you to share this information with people in your Address book, if for example, you are using Google and also have a Google e-mail account. Here are some commonly used readers for RSS. Please note however, ASCO does NOT support or endorse one reader or company above another.